Angelic is the story of a flying, talking monkey hybrid named Qora. She lives in a place where most are subservient to a religious few and worship an unfair god. She goes around questioning everything is punished with more chores for it. She will be a bride in a prearranged marriage that to a male priest named Alfer. Qora will be one of many wives. But her will is strong and she is on a quest for freedom. Even though this is only issue two I’m liking this comic that is a small measure a rif on the characters in issue 32, titled Pog from The Swamp Thing, all of whom are a tribute to the comic strip Pogo. Good stuff. Angelic #2 - “HEIRS AND GRACES,” Part Two. Meet the Complainer: a surly goth of the aquatic-mammal variety and the perfect companion for our adventurous winged-monkey heroine, Qora. LET’S GO EXPLORING! Jughead: The Hunger #1 - Jughead: The Hunger will pick up immediately following the grim conclusion of the standalone comic, which saw Jughead (after months of getting his werewolf transformations under control) give in to the hunger once more, mauling poor Reggie Mantle and skipping town. Now with Betty Cooper, Werewolf Hunter—oh by the way, that comic also revealed the Cooper family history of chasing down generation after generation of Jones family werewolves and killing them—on his trail, it’s time for the hunter to become the hunted. The Unsound #5 - Ashli and the remaining survivors try to escape the asylum before insanity envelops them all. But there are stronger forces that won’t let them leave-forces that will reveal age-old secrets about the Prince of Fools and Ashli’s role in the growing madness. 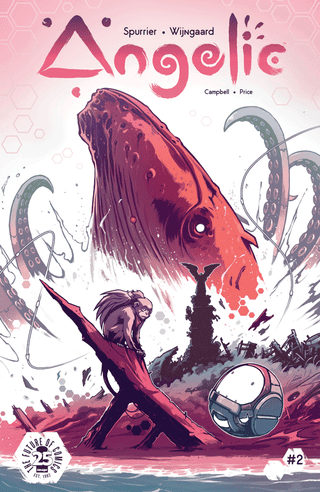 Dark Arc #2 - As the floodwaters rise, Shrae’s ark full of fiendish beasts continues on its seemingly endless voyage. But below deck, the matriarch of the naga clan has been viciously slain, and the monstrous voyagers are quick to point clawed fingers to blame each other for the murder. As tensions rise among the monsters, Shrae’s very human family is at risk of becoming victims themselves. Saga #48 - END OF STORY ARC. Ghüs and Squire have an adventure. What’s in your bag? You can include web comics.